Location: CWRU is the centerpiece of Cleveland’s University Circle, a one-square-mile flashpoint of culture, entertainment, and health care. Among the attractions just steps from our students’ doors are the Cleveland Botanical Garden, Cleveland Orchestra, Cleveland Museum of Art, Cleveland Museum of Natural History, Museum of Contemporary Art Cleveland, Western Reserve Historical Society, and University Hospitals. Professional contact: CWRU’s student-faculty ratio is a super-low 11:1, giving our students unbeatable access to experts in their fields of interest. With three major hospitals within a mile of campus as well as top medical and dental medical schools on campus, students gain unparalleled access to expert health care researchers and practitioners. • Students begin clinical placements in the third week of the first semester, netting nearly double the national average of practical experience. • Students take active roles in research and community health initiatives locally and abroad. • Programs are tracks, allowing students to major in any field they choose. • A dedicated pre-professional advisor and navigator helps students take advantage of opportunities that will help them present their strongest professional school applications. Case Western Reserve University students planning to enter the health care field are serious about success, and every facet of their college experience is geared toward equipping them with the knowledge and skills that will allow them to become 21st-century leaders in their fields. From rigorous course work and hands-on learning experiences to vibrant city living, a Case Western Reserve education prepares future doctors, nurses, biomedical engineers, and medical researchers to become distinguished academics, savvy professionals, and productive global citizens. Case Western Reserve offers more than 100 academic programs, including majors and advising in Nursing and Biomedical Engineering, as well as Pre-medical and Pre-dental Medicine tracks. Throughout the curriculum, theory is infused with practical experience: Nursing students spend more than 1,400 hours honing their skills in clinical placements—almost double the national average. Biomedical Engineering majors design working prototypes that make the hypothetical real. And pre-professional students bring their classroom learning to life by working in research labs and clinical settings. All undergrads benefit from Case Western Reserve’s common curriculum, SAGES (Seminar Approach to General Education and Scholarship). SAGES courses feature small interdisciplinary seminars that connect students to faculty and world-class institutions in our University Circle neighborhood. 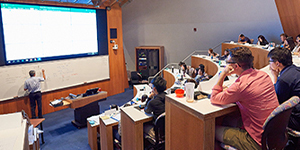 The course work focuses on sharpening the written and oral communication skills that ensure the success of CWRU students’ ideas—critical lessons that will help budding researchers and practitioners become productive members of health care teams. Case Western Reserve’s single-door admission policy allows students the freedom to dedicate themselves to all of their intellectual pursuits, giving them maximum flexibility to build their capacities in additional areas of academic interest. 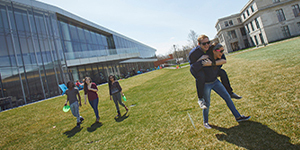 A CWRU education is founded on the belief that learning is best accomplished through a blending of theory and practice, and 98% of Case Western Reserve students participate in at least one form of experiential learning during their undergraduate careers. For those planning careers in health and medicine, learning outside the classroom commonly takes place in clinical placements, research endeavors, and service learning. A nurse’s work requires both careful skill and the ability to improvise. That’s why hands-on learning is an integral part of Case Western Reserve’s undergraduate Nursing program. 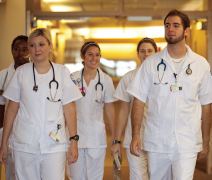 The CWRU Nursing school is a direct-admit program, meaning as soon as our students arrive on campus, they begin Nursing courses—and just three weeks later, they begin clinical placements at our local hospital affiliates. Upon graduation, they have nearly double the practical experience as their peers at most Nursing schools, giving our grads the skills and confidence they need to immediately affect the health care field. The research opportunities available to undergraduates at Case Western Reserve—in terms of both lab equipment and brainpower—are unparalleled. Undergraduates conduct experiments on campus, at the medical school, and at neighboring facilities, including Cleveland Clinic and University Hospitals. Often their hard work is rewarded when, as undergraduates, they become published authors—their results reported in some of the country’s most prized scientific journals. CWRU Health Science students find ample opportunity to help society and better their education. Volunteer activities around campus abound for Case Western Reserve students interested in health care careers, including on campus and at Cleveland Clinic, University Hospitals, and the Louis Stokes Cleveland VA Medical Center—each within one mile of campus. Case Western Reserve is the centerpiece of Cleveland’s University Circle—one of the most culturally robust communities in the nation. The area is home to more than 40 prominent artistic, cultural, educational, and human service institutions in addition to world-renowned health care centers. Partnerships with these neighbors—including three major hospitals, Cleveland Botanical Garden, Cleveland Museum of Art, Cleveland Museum of Natural History, Cleveland Institute of Music, and Cleveland Institute of Art—offer students unparalleled access to invaluable educational resources. Case Western Reserve students enjoy more than 200 student organizations and activities to choose from. They play out their potential with a Spartan athletic team, make their voices heard in a student government body, and soak up the spotlight in performing arts groups. There are also academic, religious, and multicultural groups as well as 36 social fraternities and sororities. For high-achieving students who have had their eye on medical or dental school for as long as they can remember, the Pre-professional Scholars Program offers conditional admission to Case Western Reserve’s Schools of Dental Medicine or Medicine—a top 25 medical research school—along with undergraduate admission. The highly selective program gives students a sense of security, knowing they already have achieved admission to a top professional school. Applications for the eight-year Medicine and seven-year Dental Medicine programs are due on December 1.